The weather here in Argentina is heating up again! It was around 105 degrees farenheit for most of the weekend. When the weather gets that hot, it’s debilitating. All we want to do is nap–but with one day off a week, we want to take advantage of it! 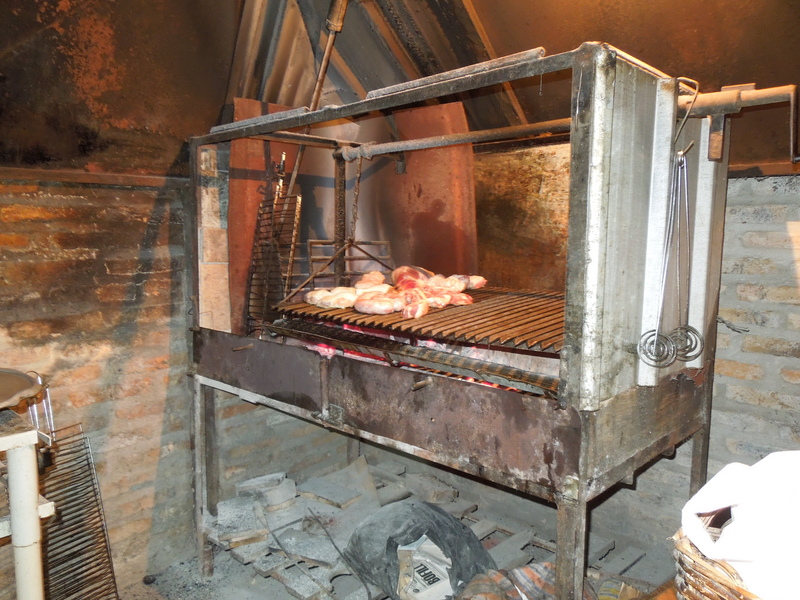 We spent Saturday night enjoying a traditional Argentinian parrilla, or barbeque. There is a nifty-looking wood carved parrilla right down the street from the hotel. 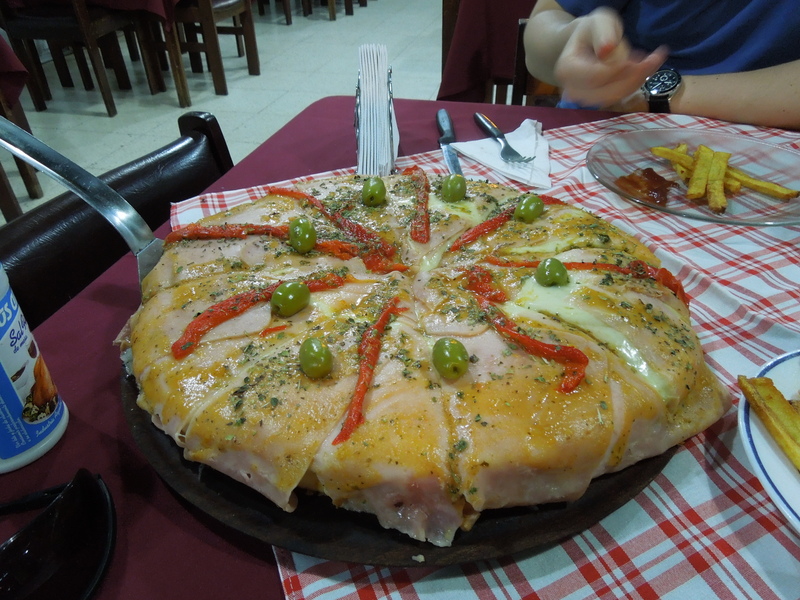 We had tried to grab lunch there a few weeks ago–but one does not merely stop by a parrilla for lunch. A parrilla is an experience. So, we decided to try again later with some trusty Spanish-speaking coworkers to get the full experience. The barbequed meat itself is called asado. The meats can include beef, chicken, lamb, and fish, among others. You start with drinks–gaseosas (sodas), agua sin gas o agua con gas (still or sparkling water), cerveza (beer), or vino (wine). We bought a few beers for the table. The beers here are rarely served in single portions. 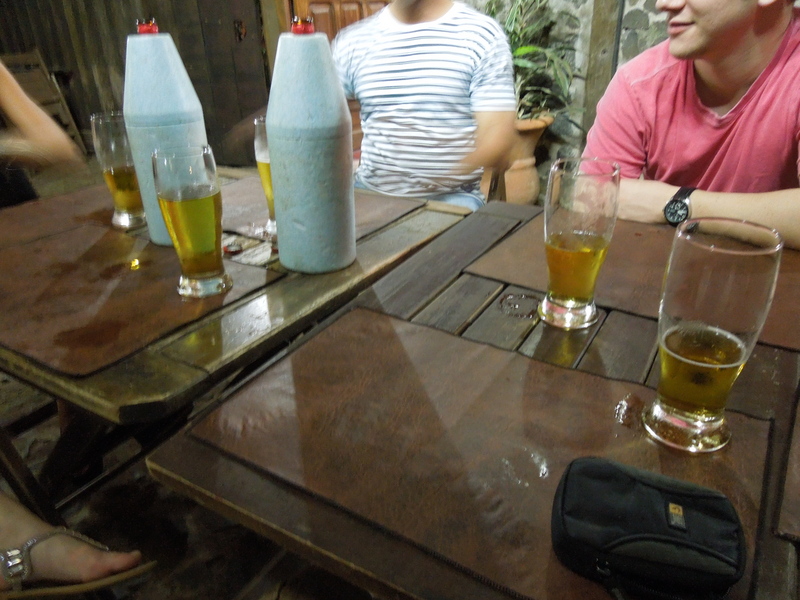 You buy a large bottle (similar to a 40 in the states), and share it around the table. Since it’s hot as all get out here, they come in foam insulators that work really well at keeping them cool during the hot Argentinian day. Then, you move onto the picados, which are essentially appetizers. In our case, we had yacare empanadas. The yacare, or jacare depending on who is spelling it for you, is a crocodile that lives down here in the marshlands. They are semi-protected–you can’t hunt them, but there are places that raise them, send a percentage back into the wild, and use the rest for food. 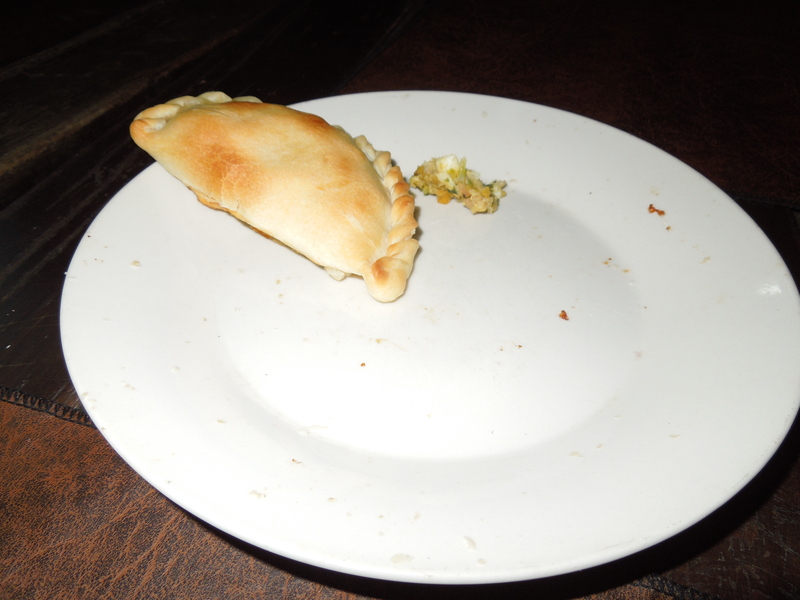 The empanadas are actually delicious–they taste like a much juicier chicken. We also ordered some ensaladas mixtas (mixed salads) for the table. The grill is really neat–in a corner of the restaurant, surrounded by windows where you can watch the meat being cooked, is the HUGE grill. T was obviously impressed by this (all photos of the grill are courtesy of him). 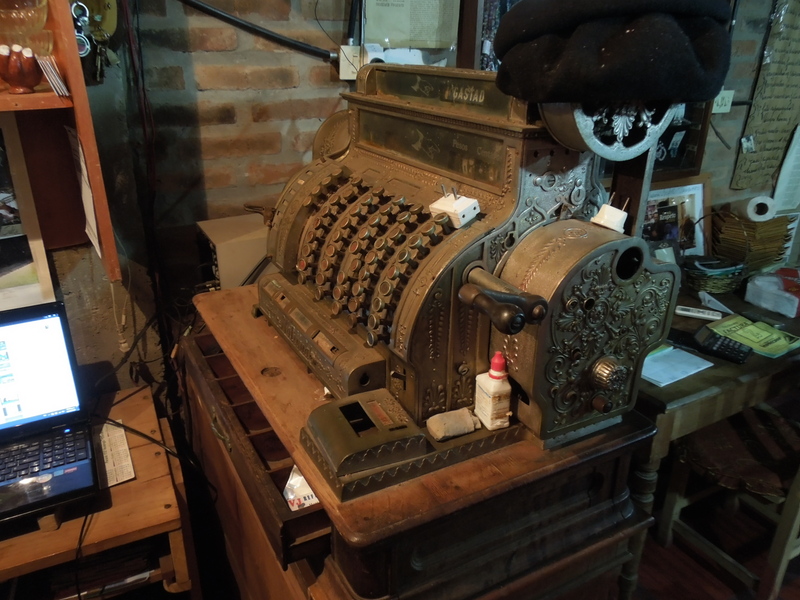 I thought the antique cash register was really awesome. 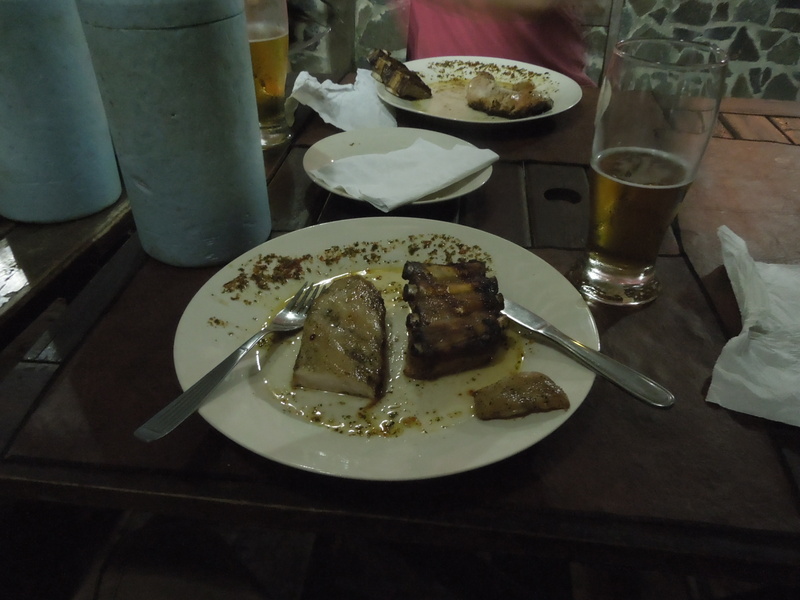 Finally, we got to the main event–asados. We had lots of choices–lots of ribs (lamb, beef, pork), pork chops, lamb chops, grilled chicken. And then, the very nice owner came out with the exciting portions… He clearly noticed the americanos at the table and were interested in showing us some of the more interesting fare. We ended up with intestines of several animals, stomach, and some other unidentified portions of animals. After a bad experience with pickled beef intestine last month… we were less than enthusiastic, but tried to try everything. I just can’t do the rubbery texture of those cuts. In all, our dinner cost about $80 for four people, and lasted around 4 hours. After that, T admitted defeat and went to bed, while I went to an Argentinian rock concert that a coworker had helped to organize. Rock–at least, original rock–doesn’t appear to have many fans in this highly traditional area. One of my coworkers mentioned that there had been a cumbia y machata concert there the week before that was packed–incredibly traditional Argentinian music that encourages dancing. The bands were not bad at all, but the concert was sparsely attended. It was interesting that out of the two bands we saw, one sang entirely in English. Judging by the inability of most people to understand what we say in English (or some hybrid form of Spanglish) here, I’m not sure how much they were understanding the lyrics they were screaming. But a good cultural experience nevertheless! A side note: we’ve been having internet connectivity issues in the hotel, and work blocks most social media sites. So, no posts on Facebook for a while, I guess! Once we get into the house, we won’t have internet at all, and we’ll see how long it takes to get it up and running. It’s been a really busy week at work, with a number of norteamericanos in town from our company to entertain. 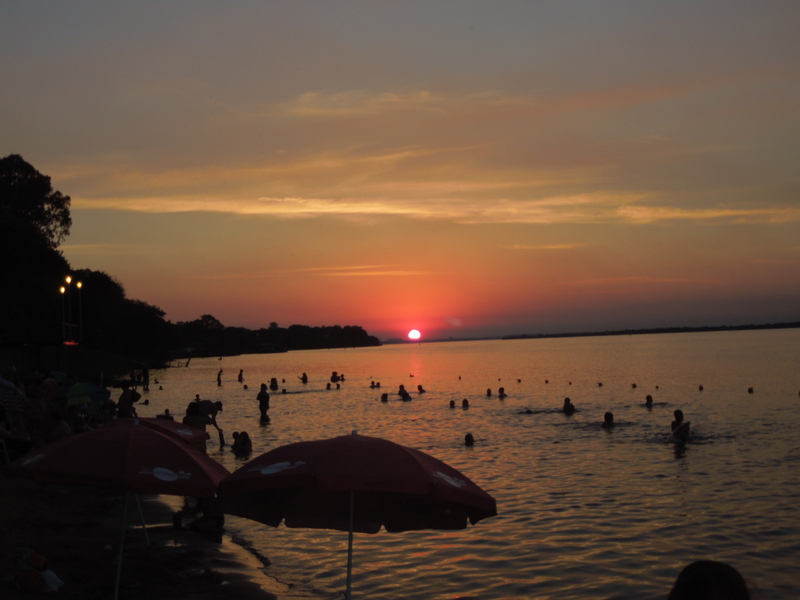 We’re hoping to have an exciting weekend of a parilla (barbeque) and an Argentinian rock concert tonight, followed by a trip to Posadas tomorrow to see the town for the first time and pick up some homegoods. With any luck, we will be in the house by the end of the week! For me, the move from hotel to house will be bittersweet. I am very excited to have a kitchen and more room and a yard…. but we don’t have internet there yet. I will, of course, still have access while at work, but since internet is a state-run utility, this may take some time. We’ve already been arguing with them for weeks to send us the letter so we can pay them to install the phone service (the precursor to internet). However, mail is not the same as in the states–no one has a mailbox, and no one gets mail with any regularity. So, we keep on searching for the letter they swear they have delivered, and now we’ve worked up to requesting a new one to be delivered. However… DirectTv is huge down here, and apparently can be installed same-day. So while we might not have internet outside of work hours, at least we’ll have television in English! It’s the same package down here as DirectTv has in the states–so we can get our fill of HGTV. We’ve watched television a bit down here, but the novelty of American shows in Spanish is starting to wear thin. We’re learning quickly, but sometimes you just want a slice of home. The beach at sunset. With all of the ice storms in Pennsylvania, it almost seems cruel to post this! 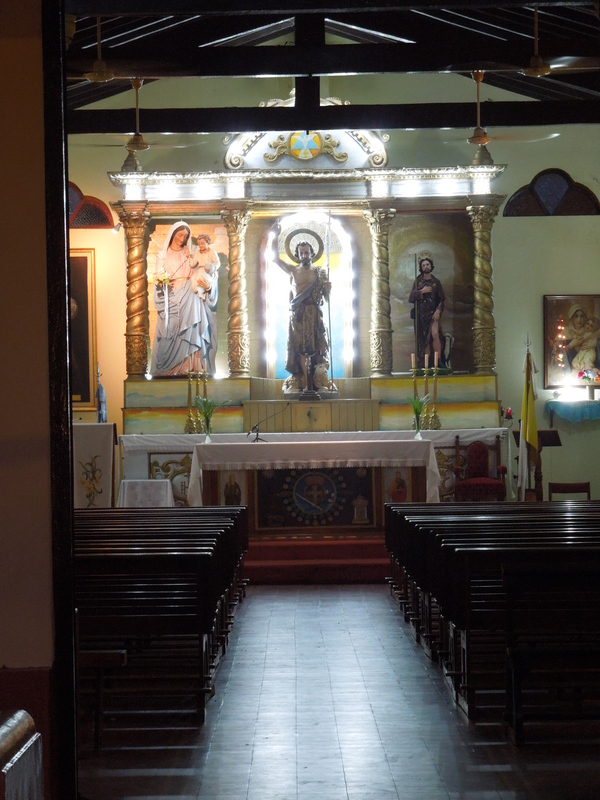 The big Catholic church in town opened its doors wide all week–the alter is incredibly fancy. It is definitely the nicest building in town–I’m sure as a result of tithing. Our absurdly huge pizza from last night. Filled with chicken, cheese, ham (which is on everything), and more cheese.